Today, the average cost to build a home ranges from $170K to $450K. These prices translate into an average home of 2,000 square feet having a construction cost per square foot rate ranging from $85 to $225. Luxury custom home construction prices can be much higher, however. On average, luxury custom homes costs range from $700K to $1.25M, but can easily skyrocket into the many millions. These prices translate into an average cost of custom home construction, on a per square foot basis, on a 3,500 square foot house, in the range of $200 to $357. Use my “cost to build a house calculator” associated with my New Home Construction Bid Sheet to accurately estimate the costs of building your custom home. You’ll note that custom home construction typically involves larger homes. Today, even average single family home sizes have been rising in finished area square footage. As of 2015, nationally the average home size has increased to 2,800 feet, per a report from the National Home Builders Association (NABA). When you get into custom home construction the amount of finished living space is even higher, with finished area living spaces ranging from 3,500 up to 10,000 square feet. Not only are custom home construction costs higher due to their large sizes, but they are also more costly on a per square foot basis due to the higher quality materials and extra features that usually accompany them. When it comes to higher quality materials, everything from doors and windows, to cabinetry and lighting fixtures, to flooring and appliance choices are typically higher end in custom homes. These higher end materials translate into significantly higher dollar figures in the custom home construction costs. It’s a similar story with unique and extra features often found in custom home building. Typically when building a custom home, the buyers require the home to have larger and upmarket kitchen and bathroom appliances and features. For example, radiant heating is often used in kitchen and bathroom floors in custom homes. In bathrooms, you’ll typically find custom tiled showers with multiple water jet-heads, and with separate Jacuzzi tubs. Moreover, you’ll often see a toilet and a bidet in a master bedroom en suite. Cabinetry and countertops are also higher end, with more exotic hardwoods being used for the cabinetry and granite or quartz being used for the countertops. Another important factor that impacts custom home construction costs is the lot size the home is built on. Again, according to NABA, the average new home built today sits on a half an acre lot (approximately 20,000 square feet) and costs around $85K for the lot. With custom house construction, the lot size can be quite a bit larger, e.g. many acres. However, in some cases a custom home may be sitting on only just a third of an acre. However, with custom home building, the land is usually priced at a premium for certain reasons, regardless of its lot size. For example, a luxury custom home is often found located on a lot that sits beside a body of water or on a golf course. Waterfront land, and property that abuts a golf course, are a scarcity, and thus the price for the building lot is much higher than the typical lot you find an average house built on. And so, as a result of the higher land costs, the average cost of custom home construction on a per square foot basis is much higher. For the average home buyer, he or she typically goes to a new housing develop that is being built, sits down with the builder or real estate firm representing the builder, and selects a house style and floor plan from half a dozen choices offered by the builder. The prospective buyer also picks one of the lots available in the development for their new home. With custom home construction the process is usually different. Often the homebuyer already has purchased the lot and is looking to have a custom home built on it. Thus, they end up hiring an architect to develop a custom house design that meets their specific requirements and that will functionally work well on the property that they have already purchased. Hiring an architect can add anywhere from 5 to 15% to the total cost of the custom home construction project, depending upon how the architect is utilized. 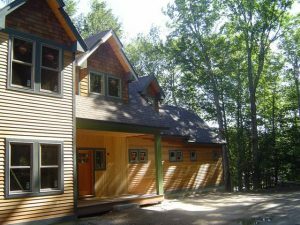 For example, an architect can simply draw up the blueprints and material lists for the custom home, and that may add up to around 5% of the total custom home construction costs. However, an architect can also provide other services, such as managing the entire custom home construction project. As a result, they put a lot more time into the project, which causes their costs to grow upwards to 15% of the total home building construction costs. In addition to higher house building construction costs, custom homes take longer to build. Unlike a home being built in a large development of new homes, getting sub-contractors to show up to a custom home development site takes more effort and time. In addition, with a custom home project there are typically more higher-end building materials used, which often results in longer lead times getting all the materials to the jobsite. Moreover, the unique features often included in a new custom home construction project take longer to construct. For example, the installation of radiant floor heating takes a lot longer to install than slapping on to the finished walls some electric baseboard heating elements. So to conclude, there are legitimate reasons why custom home construction costs are much higher than the average home construction project. Simply put, there are economies of scale that a buyer can take advantage of when choosing to have built a new house in a large new housing development. Those economies of scale don’t exist when building a custom home on a private lot. In addition, higher land costs, larger home sizes, and higher end features that typically accompany a custom home build project translate in the end to significantly higher square feet home construction costs. 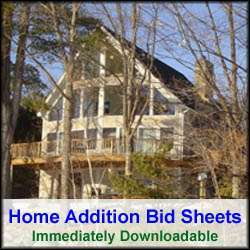 For more help on how to build a custom home, see HomeAdditionPlus.com’s New Home Construction Bid Sheet. The New Home Construction Bid Sheet provides you with the knowledge you will need on how to plan for the building of a custom home, and what to look for when hiring contractors for your new custom home building project. 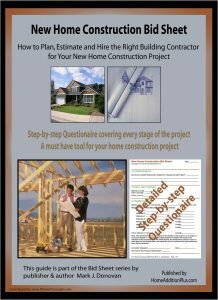 It also includes a detailed cost breakdown table and spreadsheet for estimating your own new custom home building costs.